Welcome to BushGlam Luxury Holiday Home, where you indulge yourself in modern luxurious surroundings, enjoying your own private pool and six seater Jetstreamer. 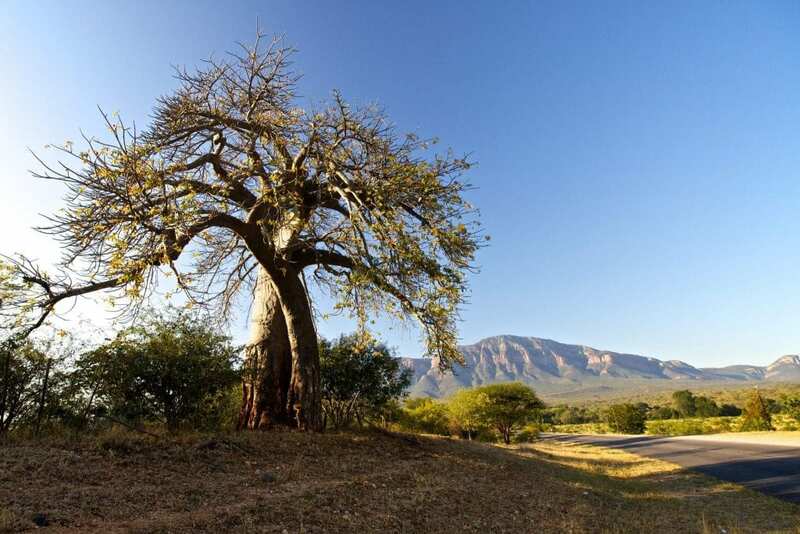 The Hoedspruit area offers wonderful wildlife experiences and excellent game viewing in the tranquility and natural beauty of the African bush. 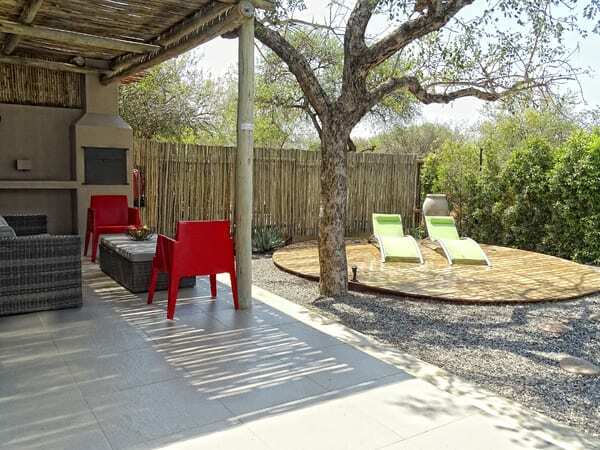 Explore the many beautiful scenic attractions such as the world famous Kruger National Park, Panorama Route, Big 5 safari drives and so much more. 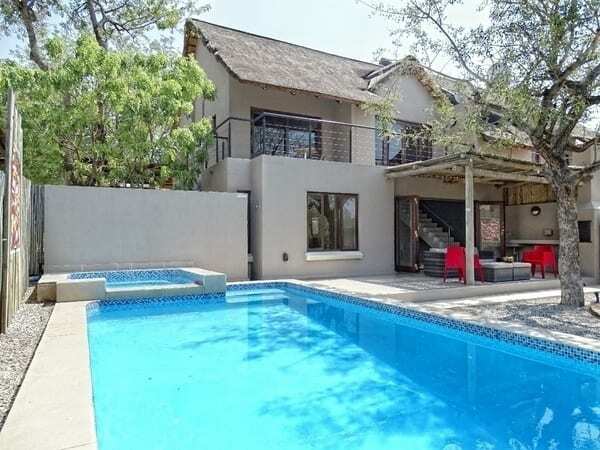 BushGlam Luxury Holiday Home comprises three modern bedrooms, two state of the art bathrooms, spacious lounges, dining area and fully equipped kitchen. 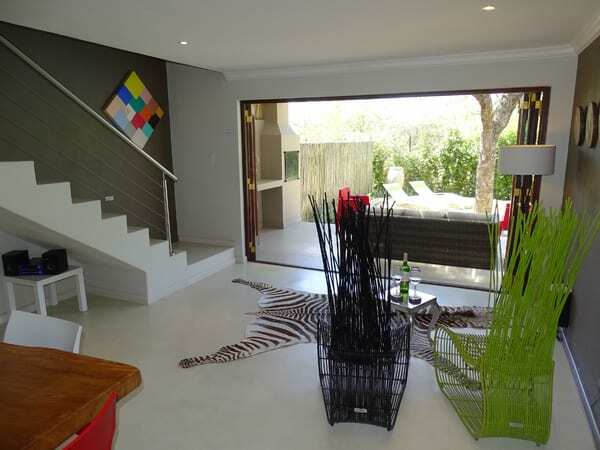 The ground floor level boasts a suburb open plan living area. 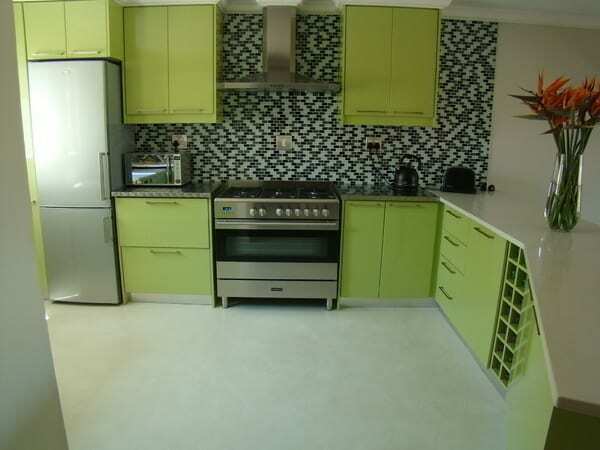 Green toned visual delight gourmet kitchen equipped with all modern appliances. Adjoined is the open plan dining room, custom made wooden dining table with modern comfortable dining chairs. A colour palette of earthy browns and vibrant greens connects the interior lounge to the garden. The inside and outside blend even more when opening the stack away doors to the shaded patio. 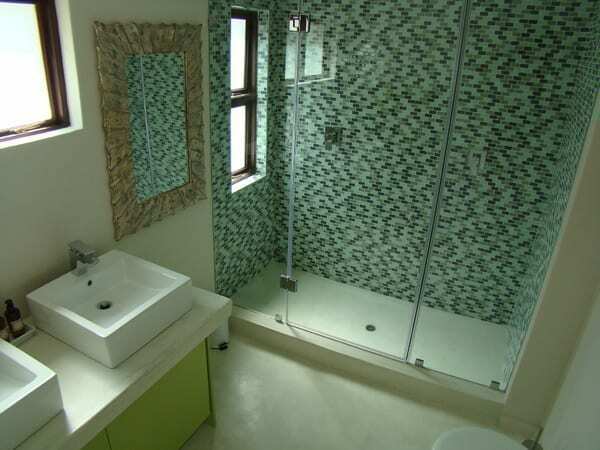 Further on the ground floor level there are two bedrooms which share one state of the art bathroom. 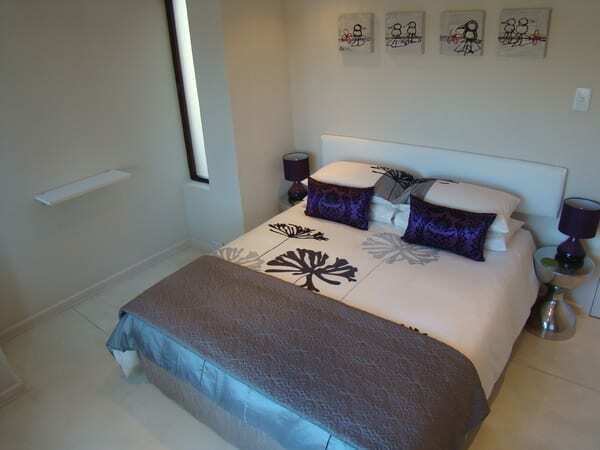 Bedroom one has a queen sized bed and overlooks the Zen garden and the bush. Bedroom two is equipped with two single beds. 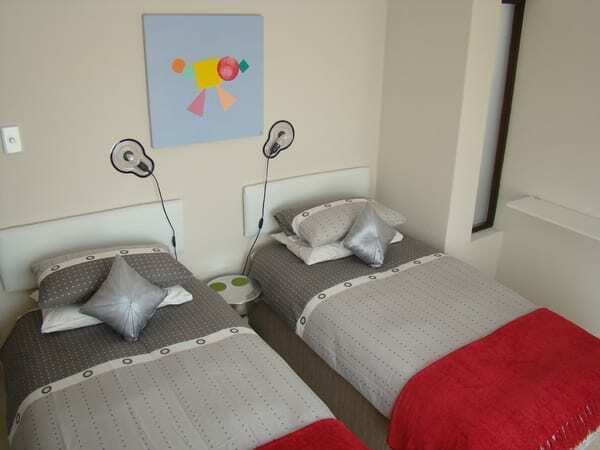 Both bedrooms have built in cupboards, high quality mattresses, bed linen and finishing. 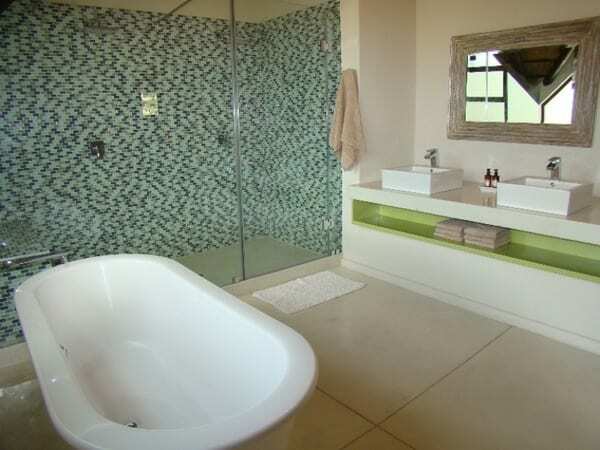 Also on the ground floor is a designerbath room with double wash basins, double rain shower behind frameless glass panels, toilet and high quality fittings all around. 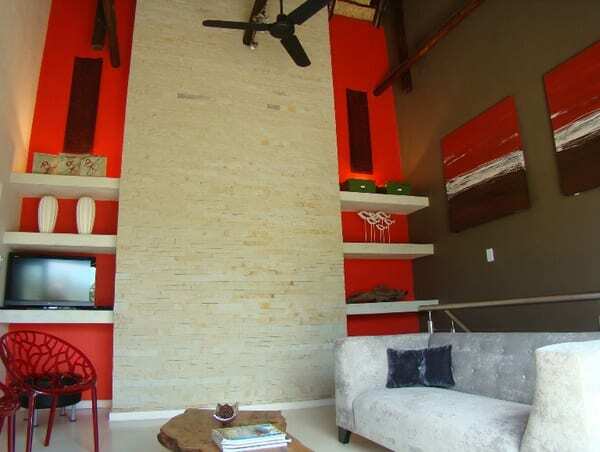 On the upper level you will find the second lounge with a red feature wall and personal art touches,comfy seating underneath the high ceiling thatched roof overlooking the bush treetops and glimpse of the Drakensbergen. 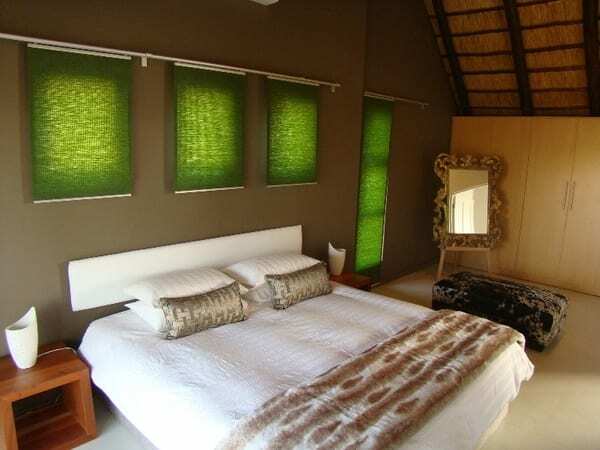 The main bedroom upstairs has a king size extra length bed and opens onto the balcony with beautiful bush views. Custom made bedside tables, green softly toned panel curtains, built in cupboards, high quality mattress and bed linen together with plush comfortable luxury fabrics, giving the bedroom intimate setting. 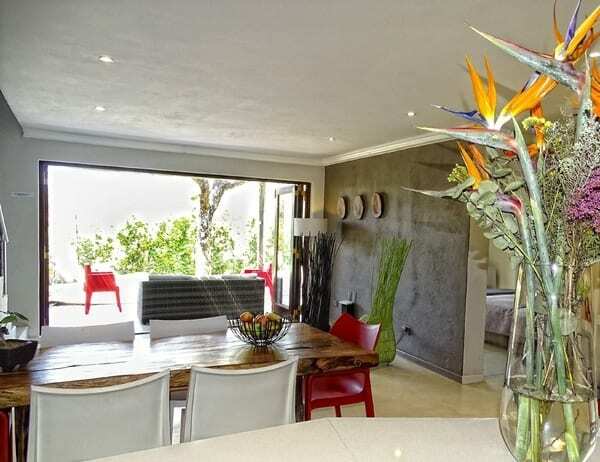 The main bedroom has a full en suite designer main bathroom with frameless glass shower panel and also here double rain showers,modern free standing bathtub, double washbasins, toilet and high quality fittings all around. The Zen garden is a luxury tranquil relaxing entertainment area. 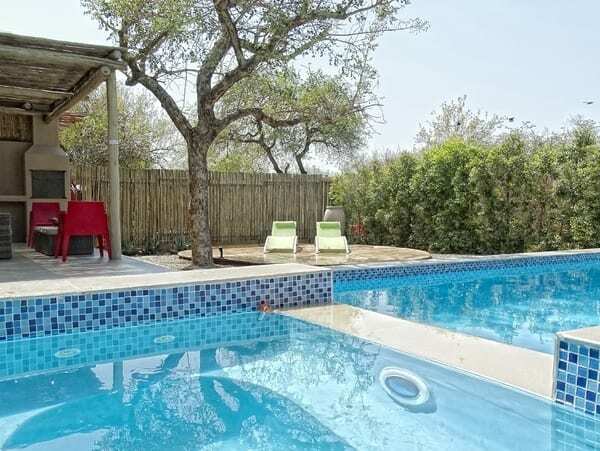 Here you can enjoy the huge pool and separate six seat Jetstreamer, sun loungers on the wooden deck, comfortable lounge seating under the shaded patio cover and outside built-in BBQ area.